Venison, Pork, Trout – All in Four Hours? 1 – Ply Base: 550mm long x 95mm wide x 9mm thick (thicker ply can be used). All timber and ply treated (H3) for wet conditions. 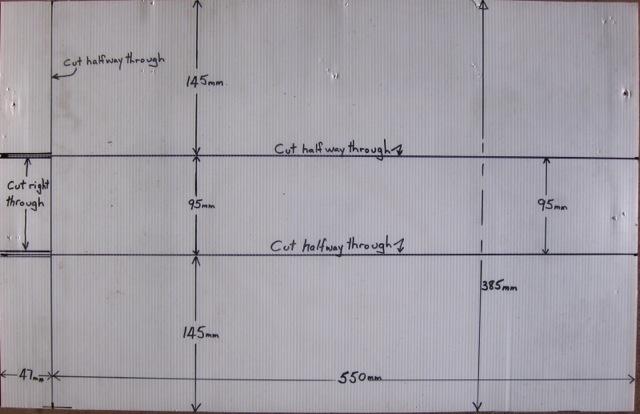 2 – Base Cross cleats; 115mm x 20mm x 25mm (or there abouts) and 4 – 30mm long galvanised clouts. Use no less than 4mm thick coreflute. 6mm is good and thicker coreflute is okay but the thicker coreflute will be harder to cut and bend. 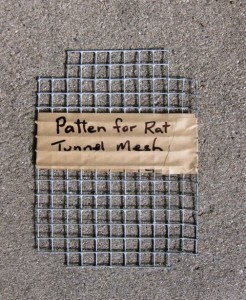 Mesh – 10mm to 12mm squares: (140mm x 190mm) or 11 squares across x 15 squares high. Please read all this before making a start! 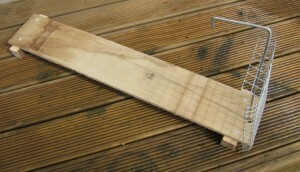 Two cross cleats (115mm x 20mm x 25mm or there about) can be fixed one each end of the ply base on the underside. Keep the cleat at the hinge end clear of the staple/hinges and the hole for the wire holding down pin. (30mm back should be okay). Fix a 20mm fence type staple (as the rat trap stop) 210mm back from mesh/trap entry end of the ply base (this is the length of the trap plus clearance for the holding down wire pin) and in the centre of the ply base. Don’t let the staple protrude on the underside of the ply. leaving them sticking out so that the mesh ‘door’ can easily be moved like a hinge. The staples will protrude through to the other side. 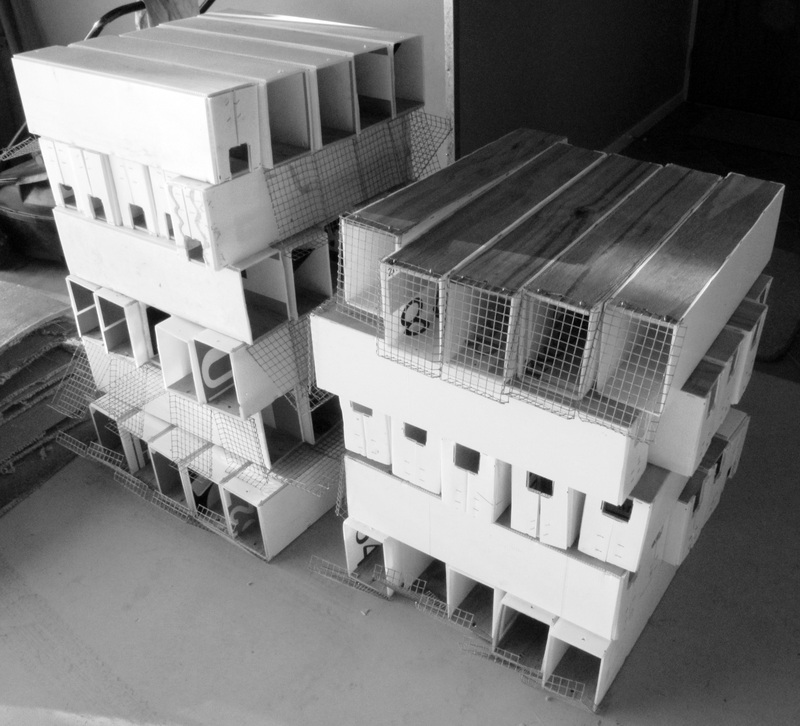 Flatten these, taking care not to restrict the swinging mesh door. After the mesh door is fitted, Drill a 8mm hole in the ply for the holding down wire pin. Keep the hole clear but as near as possible to the mesh door. 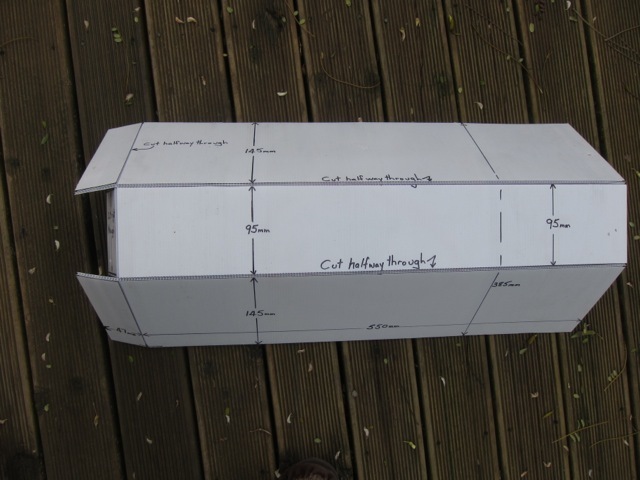 Coreflute: cut, 600mm (across the flutes) x 385mm wide. 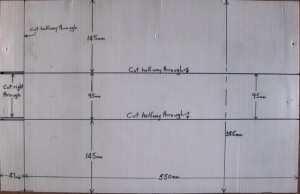 Mark out where to cut as per the illustration, cutting halfway or right through as indicated. Bend the coreflute and the end pieces at the pest entry end into place and staple this end with 12mm staples. If the staples come through on the inside, clench them over while resting/holding the coreflute on a hard surface. Staples: for fixing the coreflute to the base – I have a Rapid 34, Model B stapler and I use 12mm long staples. Staple the coreflute to the ply base. If any staples don’t go right down, tap them flush with a hammer. At the pest entrance end, fix one staple each side of the entry hole. Make sure the staples are kept clear of the entry hole to be cut out later in the coreflute. 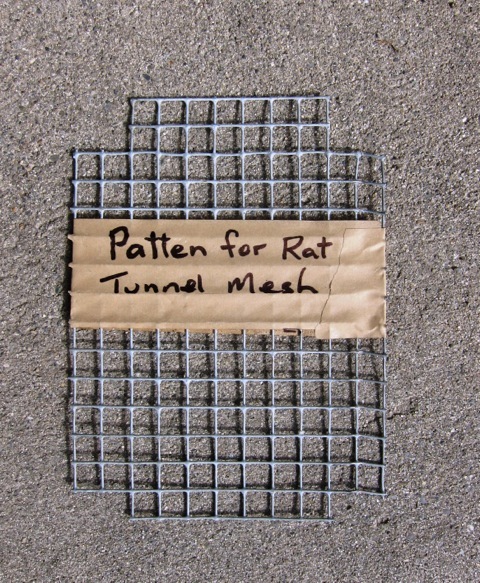 Once the coreflute is fixed to the base, close the mesh door and drill a 8mm hole through the coreflute in the centre and also through one of the mesh squares furthest from the edge. When the wire pin is pushed through this hole and into the ground it will hold the door in place and also hold the tunnel in place too. Cut the pest entry hole of 45mm x 45mm out of the coreflute. Make the wire holding down pins, 370mm overall. 270mm long then a bend at a right angle of about 90mm long. If weka are about, cut a 20-30mm wide strip from a rubber car tyre tube and place over the tunnel to cover the top of the wire pin. Weka’s will pull out the wire holding down pin, open the mesh door, and even pull the trap out from the tunnel, so be prepared. Rat Trap with Tyre Tube Weka Preventer. 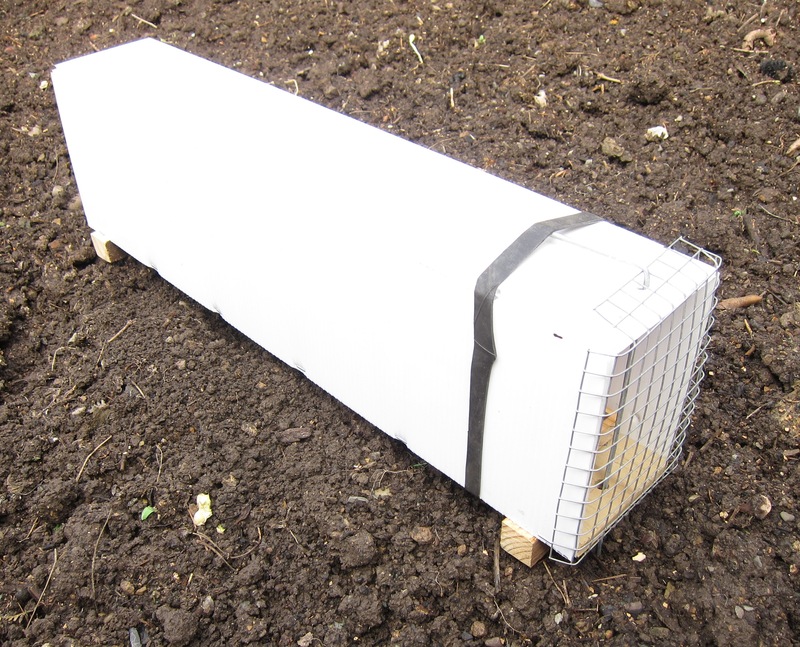 On the underside of each Victor rat trap, nail one 20mm flathead galvanised nail in each corner. Doing this will keep the trap clear of the tunnel base and allow for better ventilation especially in wet conditions. To keep the trap in good condition I have tried various ways such as using cooking oil on the steel working parts, the same on the woodwork but found that the cooking oil attracts some sort of fungus. Now after nailing the flathead nails to the base, I paint both the woodwork and the steel parts with a rust preventive paint. Once the paint has dried, I lubricate the steel parts with Vaseline. Sure, the paint smells but the rats don’t seem to mind at all and the traps last a lot longer out in the field. They are easier to clean now too. Peanut butter is good but mix it with some rolled oats and this will dry out the peanut butter a little. This will also help prolong the bait before it starts to go mouldy especially in wet weather.